Big Face dragon t-shirt with a fierce looking black dragon that has a fire burning within. Design by The Mountain.�Sizes up to 5XL. New spooky pumpkin monster face t-shirt. An orange glow radiates from the carved out eyes and jagged mouth. Design from The Mountain. Only Child M Left! �Frightening scarecrow t-shirt. You certainly wouldn't want to cross paths with this scarecrow on a dark night. Design by The Mountain.�Sizes up to 5XL. 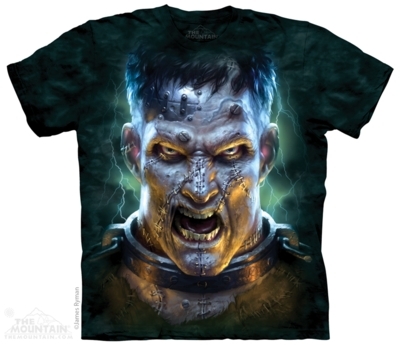 Dark fantasy t-shirt with a portrait of a frightening Zombie. Design by The Mountain.�Sizes up to 5XL. Zombies are cool. Zombies that can scope out the party for you are beyond awesome.�Slip on the Frantic Zombie Eyeballs T-Shirt and let this denizen of the undead be your wingman as he scopes out the party for you. Blow everyone away with the incredibly lifelike and spooky way your new best friend looks about the room. Creepy? Yes. Completely awesome? Absolutely! You'll need a pair of ear mufflers to go with this Frantically Moving Eyeball T-shirt because of all the SCREAMS it will cause! Dark fantasy t-shirt showing a cat that�has turned into a nasty looking zombie. Design by The Mountain. Dark fantasy t-shirt showing an�ancient mummy, with it's bandages loosened to reveal a horrific face.�Design by The Mountain.�Sizes up to 5XL. The reaper in his cloak and chains laughs as he takes you away, on this dark fantasy t-shirt.�Design by The Mountain.�Sizes up to 5XL. Fantastic frankensteins monster t-shirt.��Design by The Mountain.�Sizes up to 5XL. Dark fantasy t-shirt showing a man changing into a werewolf.�Design by The Mountain.�Sizes up to 5XL. Dark fantasy zombie t-shirt. You only notice when the moon sheds light on the zombie, just how horrific it really looks.�Design by The Mountain.�Sizes up to 5XL.